Meet up with local artists at the Fenton Community & Cultural Center every Wednesday in the Art room. Drop in for a meet and greet, or simply come to create (bring your own supplies). If this is your first time coming to the Open Art Studio or if you have questions, please email us at the below email address. This program is sponsored by the SLPR and the Fenton Community & Cultural Center. $15 supply fee payable to the instructor at the class. It’s Party Time! We are going to Paint’n Party tonight. Everything will be provided for you. Painting supplies, and snacks will be provided. There will be door prizes too! All you need to bring is a non-alcoholic beverage of your choice. Feel free to bring a snack to share as well if you would like. The painting will be a Simple Daisy that says so much. Instructor, Donna Roskamp, will teach the project step-by-step as you complete the painting in class. A supply fee of $15 is payable to the instructor. 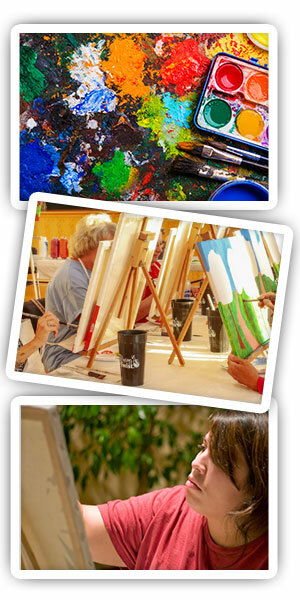 Painting supplies & snacks will be provided for this fun night of culinary creativity! You will be supplied a line art illustration created by the instructor, Danielle Golinski (which means no drawing skills necessary!) featuring seasonal vegetables to paint in watercolor. Watercolor tips and techniques will be shared and everyone will bring home a completed, colorful work of art. Looking for Youth Art Classes?